Abu Hanifa al-Dinawari (d.895 CE), botanist, lived in Andalusia, in Muslim Spain. His work has been made known by the German scholar, Silberberg, in a thesis, published in Breslau in 1908 which contains the descriptions of about 400 plants. However, what is described by Silberberg is just a small part of what has survived; just two volumes out of the six. The place of Islamic botany and its role in medical human civilisation have received a great deal of interest in the works of very possibly today’s leading authorities on the subject: Bashar Saad and Omar Said. 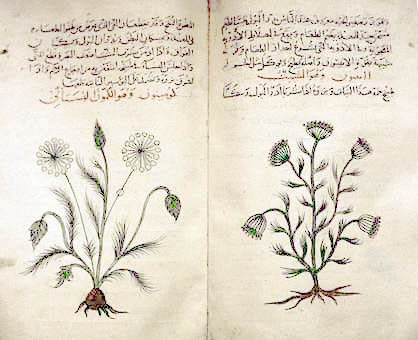 The pioneering work of these two scholars, and some of their colleagues has brought to our knowledge, or more precisely, has reawakened world interest in the vast contribution of Muslim herbalists and botanists, and how the work of such medieval botanists remains a vast repertoire of knowledge that can help in the cure of many ailments. They hence remind us that In the Middle Eastern region, there are more than 2600 known plant species; about 200–250 of them are still in use for the treatment and prevention of various diseases. The number of herbal-derived substances that are in use as traditional compounds is about 286. Results obtained in an extensive survey indicate that about 129 plant species are still in use in the treatment of various human diseases, including cancer, skin, respiratory and digestive disorders, diabetes and liver diseases. Plant parts used include leaves, flowers, stems, roots, seeds and berries. It is beyond the scope of this work to add anything further to what these scholars have studied. The use of their work is a necessity upon any curious mind. What can be said here is that these scholars are the continuators of a tradition, which began over a thousand years ago, and one of it earliest pursuers, if not the earliest, was Al Dinawari. The surviving parts of this book, originally comprising 7 volumes, show clearly how far and how rapidly a branch of knowledge hitherto cultivated by the Greeks could already develop in complete independence from them amongst Muslim philologists before the end of the 9th century. In his expose on the earth, Al-Dinawari describes a variety of soils, explaining which is good for planting, its properties and qualities. Al-Dinawari also describes plant development from its birth to its death, including the phases of growth and the production of flower and fruit. He then covers various crops including: cereals, vines and date palms. Relying on his predecessors, he also explains trees, mountains, plains, deserts, aromatic plants and woods, plants used in dyes, honey and bees. Al-Dinawari also devoted one chapter to the classification of plants (tajnis al-nabat) which he mentions in one of the volumes that have survived, but the work itself on the subject has also been lost. 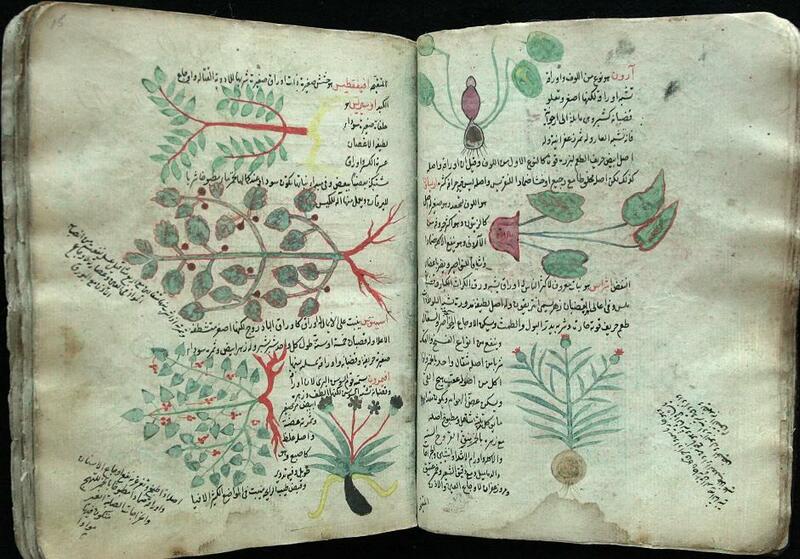 Al-Dinawari's Book of Plants also covers various other subjects such as astronomy and meteorology. His book bears witness to the use of a scientific botanical terminology. He knows a lot of specialised expressions for the diverse features of plants which in an unbiased reader evokes the impression that they were part of a scientific nomenclature created for the sake of greater precision.” He displays an advanced scientific–morphological attitude, is familiar with the observation and description of physiological aspects and illustrates “complicated shapes in plants by comparison with familiar types. Despite the increasing use of medicinal plants, their future, seemingly, is being threatened by complacency concerning their conservation. Medicinal plants in the Middle East are becoming increasingly rare, as a result of the ongoing destruction of their natural habitat, the over-harvesting of wild species and detrimental climatic and environmental changes. Hence, it is predicted that in semi-arid regions such as the Middle East, a number of species will have disappeared within the next 10 years or so, particularly in the desert or dry areas where almost a third of native plants are found, unless urgent measures are taken to protect and preserve them. This is paradoxical at a time when there is an increasing interest worldwide in herbal medicines accompanied by increased laboratory investigation into the pharmacological properties of the bioactive ingredients and their ability to treat various diseases. Front cover of Ibn al-Baytar (d. 646 H / 1248 AD): Tafsir kitab Diyasquridus fi al-adwiya al-mufrada (A Commentary on Dioscorides' Materia Medica), edited by Ibrahim Ben Mrad (Carthage (Tunisia): Bayt al-hikma, 1990). Saad B and Said O: Greco-Arab and Islamic Herbal Medicine: Traditional System, Ethics, Safety, Efficacy and Regulatory Issues, Wiley-Blackwell John Wiley & Sons, Inc. 2011. Azaizeh, H., Saad, B., Khaleel, Kh. and Said, O. (2006) The state of the art of traditional Arab herbal medicine in the eastern region of the Mediterranean: a review. eCAM 3, 229–235. Said, O., Khalil, K., Fulder, S. and Azaizeh, H. (2002) Ethnopharmacological survey of medicinal herbs in Israel, the Golan Heights and the West Bank region. Journal of Ethnopharmacology 83, 251–265. Lev, E. and Amar, Z. (2002) Ethnopharmacological survey of traditional drugs sold in the Kingdom of Jordan. Journal of Ethnopharmacology 82, 131–145. Bashar Saad, Hassan Azaizeh and Omar Said: Arab herbal Medicines; in “Botanical Medicine in Clinical Practice”, Ed. Watson, R. R. and Preedy, V.R. ; CABI, Wallingford, UK. 2008; pp. 31-39; at pp. 33-4. F. Sezgin: The Istanbul Museum for the History of Science and Technology in Islam, an Overview; Istanbul, 2010; p. 184. Bashar Saad, Hassan Azaizeh and Omar Said: Arab herbal Medicines; in “Botanical Medicine in Clinical Practice”, Ed. Watson, R. R. and Preedy, V.R. ; CABI, Wallingford, UK. 2008; pp. 31-39; at p. 32. Oriental Garden in Berlin at the Marzahn Park, opened in 2005. 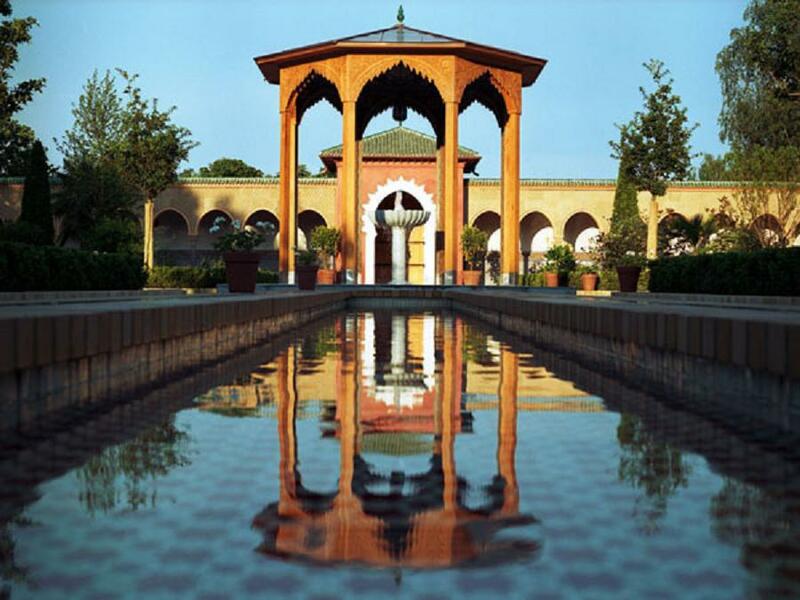 This 58 x 31 metre garden offers a window onto Muslim civilisation in the multicultural city of Berlin. The layout adheres to the essential traditions of the Islamic garden: the garden courtyard is centred around a fountain pavilion and divided into quarters by water channels oriented to the cardinal points; ornamentation is essential to the garden: calligraphy, floral arabesques and ‘zillij' are found on the walls, timber carving on the pavilion, ‘muqarnas' on the vestibule, and painted wood in the arcades; planting provides shade, colour, fragrance and taste. (Source).